Mott couldn’t resist falling in behind them, and now he is at the front of the line as the Black Panther Party cranks up to mark its 50th anniversary celebration, beginning with an all-day symposium Saturday at Laney College. “The Black Panthers were the single greatest effort by blacks in the United States for freedom and self-determination,” he said, as keynote speaker for a news conference Friday at the Oakland Museum of California. The museum will be the site of a three-day conference on the Panthers that will take over the entire 7.5-acre museum compound for three days, Oct. 20-23. 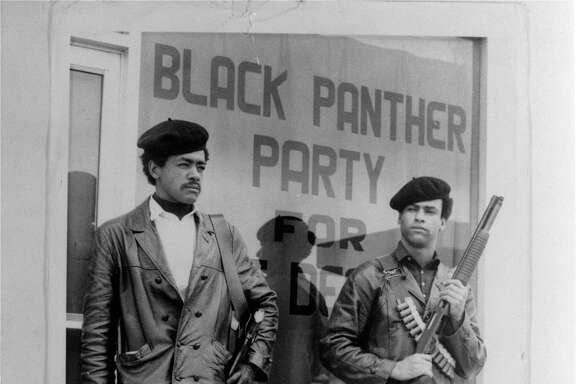 The symposium will coincide with the museum exhibit “All Power to the People: Black Panthers at 50,” which will include original Panther berets and rarely seen photographs of day-to-day life among the Panthers, taken by party members. The marquee item, borrowed from Stanford, will be the original draft of the Panther “10 Point Platform and Program” written by hand by party co-founder Bobby Seale. Seale, who has written a screenplay about his life in the Panthers, was noticeably absent from Friday’s event. That’s because he is putting on his own 50th anniversary events on behalf of the National Alumni Association of the Black Panther Party, which he says will draw more than 200 Panthers to the Bay Area in October. Former Black Panther Party member Timothy Thompson, who joined the party in 1970. Also absent was David Hilliard, founding member and chief of staff of the Panthers. He was on the schedule but called in sick. This left it to several later members, led by Mott, who now goes by the name Saturu Ned, 67, and Elaine Brown, 73-year-old former chairwoman of the Black Panther Party. Brown, an activist and one-time presidential candidate, arrived with her right arm in a sling, the result of a much-publicized dustup with Oakland City Councilwoman Desley Brooks, in an Oakland soul food joint. Brown has filed suit against the city and Brooks for $7 million, claiming injuries that required surgery. Oakland Mayor Libby Schaaf was on hand for the news conference to claim her own link to the Panthers. This is based on the fact that Schaaf is also 50 and is the 50th mayor of Oakland. “Growing up in Oakland with the Black Panther Party gave me a skeptical eye,” Schaaf began her remarks, later concluding them by declaring October to be Black Panther History Month in the city of Oakland. Bobby Seale, chairman of the Black Panther Party, addresses a rally outside the party headquarters in Oakland in 1971, calling for a boycott of certain liquor stores. The call to action was to patrol the streets in uniforms of black leather jackets and turtlenecks and berets, but those uniforms and military marches were mostly theatrics, Ned said Friday. The more effective action was to distribute food and medical treatment to the poor. The party launched a free breakfast program for neighborhood schoolchildren. Soon enough, FBI Director J. Edgar Hoover called the Panthers “the greatest threat to the internal security of the country.” This only aided the lore, and probably helped with recruiting. At their peak, the Panthers had thousands of members and offices in 68 cities. Nationwide, the single act that most boosted Panther membership was probably the assassination of the Rev. Martin Luther King Jr., on April 4, 1968. “That was our 9/11,” said Ned. But there was also an assassination two days later and closer to home, the death of original Panther Bobby Hutton, in a shootout with Oakland police. Hutton was 17, and since then, DeFremery Park in West Oakland has been commonly known as “Bobby Hutton Park.” Now the city will officially rename a portion of the park as Bobby Hutton Grove. It will be October April 23, and 500 bags of groceries will be distributed in the community in honor of the Black Panther Party. As an organization, the Black Panthers lasted just 16 years, from 1966 to 1982, but the legacy is still going strong at 50, and for those three days in October, “people will be coming from all over the world,” predicted Brown. It won’t be for nostalgia. The title of the conference, “Where Do We Go From Here?” suggests the goal will be to recapture that momentum, which was sparked in 1966 and is waiting to be rekindled. Sam Whiting is a San Francisco Chronicle staff writer. Email: swhiting@sfchronicle.comInstagram:sfchronicle_art. (Oakland, CA) April 28—The Oakland Museum of California (OMCA) has announced details of its major fall exhibition All Power to the People: Black Panthers at 50 to coincide with the 50th anniversary of the Party and continuing OMCA’s commitment to examining topics and themes that are socially relevant and meaningful to the community through exhibitions, programs, and partnerships. 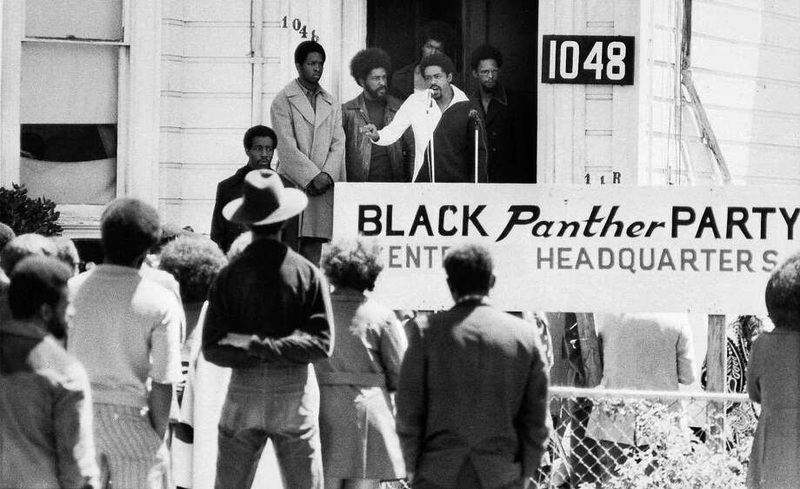 Organized by OMCA Senior Curator of Art René de Guzman and Experience Developer Lisa Silberstein, All Power to the People: Black Panthers at 50 will explore the Party’s stories of human achievement and struggle to support the needs of the oppressed. The exhibition will delve into aspects of the Party that are not often told, such as its survival programs, the presence of women and rank and file members, its use of media and art, and its founding Ten Point Program that continues to inform and inspire contemporary movements of change today. All Power to the People: Black Panthers at 50 will open October 8, 2016, to coincide with the anniversary of the Black Panther Party’s founding on October 15, 1966, and will run through February 12, 2017, in the Museum’s Great Hall. historical and social contexts of the late 1960s that demanded the founding of the Black Panthers, presenting the complex stories of the Party and its work to make revolutionary change possible. “Controversial to some yet inspirational to many, we wanted to understand why the Black Panther Party continues to capture people’s imagination today,” says René de Guzman. “This project has transformed how I understand the world and we hope to provide a similar sense of revelation. The Black Panthers are a deeply local story that’s had lasting national and international influence.” “As an Experience Developer, I assure that our work is accessible and holds meaning for the breadth of our visitors,” adds Lisa Silberstein. “This is a story of human struggle and innovation and the Black Panthers’ resonance with our time is potent. The content of this exhibition carries significant weight and will likely bring to the surface a range of emotions: from grief and anger to hope and pride. It is our desire to provide within the exhibition places to pause and reflect.” The exhibition will explore various themes of the Black Panther Party including its Ten Point Program; social innovations; their leadership in coalition-building; community programs such as free breakfasts, medical clinics, and liberation schools; armed patrols of the police; the Party’s influence on culture; state repression; and the Black Panthers viewed from today; as well as other topics. • Artist Sam Durant’s interactive Proposal for a Monument to Huey P. Newton for the Alameda County Courthouse, a bronze peacock chair that asks visitors to put themselves into the role of the subject in the exhibition. • A rare handwritten draft of the Ten Point Program from 1967 and an audio recording of Bobby Seale sharing his thoughts and the conditions related to the Program’s creation. • MacArthur Genius Award winning artist Carrie Mae Weems presents her powerful installation Constructing History: A Requiem to Mark a Moment that provides a meditative space to consider how history is made through memory. • A premiere of a new video work by Carrie Mae Weems on civil liberties issues and the surveillance state. • Black Righteous Space, an interactive, sound-activated installation by artist Hank Willis Thomas that includes Black Power music and speeches from the 1960s to the present. • Never-before-seen documentary and every day photographs of Black Panther members and significant historical events. • Iconic and rare posters and graphic materials demonstrating the Black Panthers use of media and art to communicate and inspire. • A painted rifle belonging to a former Party member. • An immersive video experience that features interviews with former Black Panthers, contemporary artists, social activists, and youth that draws dramatic parallels between the historic movement and contemporary activism. • Works by Ruth-Marion Baruch, Elizabeth Catlett, Alan Copeland, William Cordova, Ducho Dennis, Emory Douglas, Gayle Dickson, Sam Durant, Mere-Sia Gabriel, Kenneth Green, Sr., Chinaka Hodge, David Huffman, Pirkle Jones, Trevor Paglen, Stephen Shames, Bryan Shih, Hank Willis Thomas, Carrie Mae Weems, and others. A schedule of public programs will enhance the exhibition during its run and details will be announced on the OMCA website, museumca.org. Open Engagement 2016—POWER will take place at the Oakland Museum of California and additional sites throughout the Bay Area. An annual, three-day artist-led conference dedicated to expanding the dialogue around socially engaged art, the conference will explore the centralized theme of POWER, guided by the curatorial vision of OMCA’s Senior Curator of Art René de Guzman, and will feature keynote speakers Angela Davis and Suzanne Lacy. Founded in 2007, Open Engagement has evolved into an unparalleled hub for practitioners and audiences of socially engaged art to assemble. It is the only conference on this subject of this scale that operates on an inclusive open call model that supports emerging and established artists and collaborates closely with national institutions to further the networks of support for socially engaged art. Open Engagement—POWER (2016) in partnership with the Oakland Museum of California and the California College of Arts (CCA) marks the first year of a three-year cycle, followed by Chicago (2017—JUSTICE) in partnership with University of Illinois Chicago, and New York (2018—SUSTAINABILITY) in partnership with the Queens Museum. Opening in July 2016 in OMCA’s Gallery of California Art, Oakland, I want you to know… is a new exhibition that explores current and accelerating social, economic, and demographic changes in West Oakland as seen through the eyes of the community. The exhibition will feature artworks co-created by artists and West Oakland residents, and will invite Museum visitors to share their thoughts about what’s happening in Oakland right now. The exhibition asks people to answer the question “How can new and longtime residents of Oakland play an active role in shaping the changing identity of our city while preserving the aspects of what make West Oakland unique?” In this artist and community driven exhibition co-created with artist Chris Treggiari and OMCA Curator of Public Practice Evelyn Orantes, visitors will encounter video installations, images, and community projects contained in environments inspired by some of the iconic structures found in West Oakland like a Victorian home, a contemporary loft, and the now-shuttered Esther’s Orbit Room bar and blues hall. Within each space, visitors will be introduced to different key conversations from the neighborhood through the voices of the people, institutions, and businesses that call West Oakland home. Through the lens of her camera, Dorothea Lange documented 20th century life with riveting, intimate photographs that showed the major issues of the times. The emotional impact of her works continues to resonate with millions and illustrates the power of photography as a form of social activism. From documenting the plight of Dust Bowl migrants during the Great Depression to magnifying the grim conditions of incarcerated Japanese Americans during World War II, Lange’s photographs demonstrate how empathy and compassion, focused through art, can trigger political action. Dorothea Lange: Politics of Seeing presents approximately 100 photographs to celebrate the 50th anniversary of the artist’s gift of her personal archive to the Oakland Museum of California. Drawing upon vintage prints, unedited proof sheets, personal memorabilia, and historic objects, this exhibition takes a unique approach to a beloved American photographer by examining how her artistry and advocacy swayed minds and prompted significant change in this nation’s history. OMCA presents the first-ever museum exhibition to focus on marijuana in California today. Designed as a catalyst for conversation and reflection around the marijuana plant, its uses, evolving public attitudes, and the complex policy and social issues surrounding it, the exhibition explores the many ways that people consider cannabis, presented through the perspectives, knowledge, and opinions of a diverse range of community members and groups. With marijuana increasingly in the news, and California on the verge of making important decisions around marijuana that will impact people living in this state, the exhibition provides a community space where people can come together to learn, question, discuss, and add their voice to the different points of views surrounding this complex and evolving topic. ABOUT THE OAKLAND MUSEUM OF CALIFORNIA: The Oakland Museum of California (OMCA) brings together collections of art, history, and natural science under one roof to tell the extraordinary stories of California and its people. OMCA's groundbreaking exhibits tell the many stories that comprise California with many voices, often drawing on first-person accounts by people who have shaped California's cultural heritage. Visitors are invited to actively participate in the Museum as they learn about the natural, artistic, and social forces that affect the state and investigate their own role in both its history and its future. With more than 1.9 million objects, OMCA is a leading cultural institution of the Bay Area and a resource for the research and understanding of California's dynamic cultural and environmental heritage. onsite underground parking and is conveniently located one block from the Lake Merritt BART station, on the corner of 10th Street and Oak Street. The accessibility ramp is located at the 1000 Oak Street main entrance to the Museum. museumca.org.